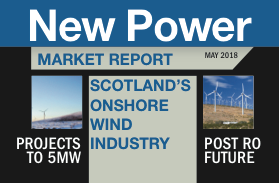 Scottish Equity Partners (SEP) has sold its portfolio of onshore wind farms to Pensions Infrastructure Platform (PiP) for an enterprise value of £50 million. The portfolio contains all five of the wind farm investments made by the Environmental Capital Fund (ECF), a specialist infrastructure fund managed by SEP. Totalling 64 turbines, the wind farms range from single-turbine sites across the Orkney and Shetland Islands to utility-scale turbines in Curraghderrig, Ireland and the Port of Tilbury in London. PiP’s existing wind assets include Aura, one of the largest stand-alone Feed in Tariff wind portfolios in the UK, and a minority shareholding in a 550MW 24-site wind portfolio operated and majority owned by EDF. SEP sold the Indigo Pipelines gas network in the UK to Arjun Infrastructure Partners in February. The Environmental Capital Fund (ECF) is an infrastructure fund targeted at UK based energy infrastructure projects – including wind, gas, CHP and district heating schemes. Formed in 2014, ECF is backed by SSE plc, as well as a syndicate of financial investors led by Lexington Partners and Hermes GPE.